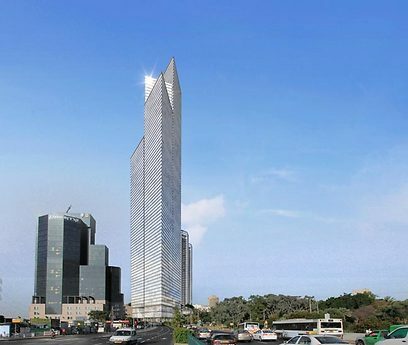 The Tel Aviv Municipality's Local Committee has approved a plan for the construction of Israel's tallest residential, business and leisure complex. The Keren Hakirya project will see the construction of two 80-story and 50-story office buildings, which together include 100,000 square meters, and two 45-story residential buildings which will include up to 770 housing units. The plan has now been submitted for the approval of the Tel Aviv District Committee. The project will be built on the corner of Shaul Hamelech and Weizmann streets. As part of the plan, which is being promoted by the Israel Land Authority, 20% of the housing units in the project will be small apartments measuring up to 65 square meters (700 square feet), and the rest will measure 85 square meters (915 square feet). The project is located on the northeastern corner of the northern Kirya Base compound, on an area of more than 9 acres, and is the second compound approved by the Municipality in the northern Kirya area. The project was approved as part of the "green line agreement" signed between the Israel Land Authority, the Tel Aviv-Jaffa Municipality and the Finance and Transportation ministries. The agreement includes several projects in the area and links their execution with a solution for creating an underground light rail on Ibn Gabirol Street (the Green Line). According to the Israel Land Authority, the Keren Hakirya project aims to tackle the shortage of offices and apartments in Tel Aviv. The complex's planners, led by architect Isaac Halfon, say the office buildings will be designed as triangular prisms and called "Toblerone Towers" due to their resemblance to the Swiss chocolate bar brand. The compound itself has been given the name " Rockefeller of the Unstoppable City." The residential buildings will be constructed over commercial floors, and will create one compound together with the office buildings which will include bicycle tracks and pathways for pedestrians. The project will also have an underground parking. According to Gili Tessler, the Tel Aviv district planner, "The importance of the Keren Hakirya project is measured by several parameters, including its centrality in the urban entity... In addition, the compound carries an important public task – inlaying the light rail's Green Line on the Ibn Gabirol route, and contributes to significantly increasing the supply of small housing units in the city in a central location. Israel Land Authority Director Bentzi Lieberman adds that "the advancement and approval of the plan is the result of the blessed strategic cooperation between the Israel Land Authority and the Tel Aviv Municipality, which has yielded the furthering of new housing units in Tel Aviv-Jaffa. This move creates a change in the market supply in the city and can reflect on the entire national market as well." According to figures compiled by the Council on Tall Buildings and Urban Habitat (CTBUH), the tallest building in Israel today is the Moshe Aviv Tower in Ramat Gan, which has 68 floors. It is followed (in meters) by the Azrieli Center's circular tower in Tel Aviv with 49 floors, Leonardo City Tower in Ramat Gan with 37 floors, the Azrieli Center's triangular tower with 46 floors, the Electra Tower in Tel Aviv with 45 floors, Hayovel Tower in Tel Aviv with 42 floors, W Tower in Tel Aviv's Park Tzameret with 46 floors, Azrieli's square tower with 42 floors, the Kiryat Atidim compound in northern Tel Aviv with 36 floors, and the Neve Tzedek Tower with 44 floors. According to Israel's representative on the CTBUH, Israel David, vice chairman of the Israeli Union of Engineers in Construction and Infrastructure, "The Israel's high towers are not considered skyscrapers in comparison with the global standard of building. Although building upwards raises a lot of interest in Israel, 21-story buildings which are 60-70 meters (195-230 feet) tall are not longer considered tall buildings compared to what we see in the world." David adds that "30 years ago, an eight-story building was considered tall in Israel, and today it's not even included in this criterion. Buildings more than 200 meters (655 feet) tall are built in the world routinely. The tallest building being built these days is in Saudi Arabia, and it will be 1,000 meters (3,280 feet) tall. "In Israel there are plans for buildings of 60 stories and more as residential buildings in central cities, including Tel Aviv, Ramat Gan and Bat Yam. In the coming years this will be the next generation of tall buildings in Israel." See all talkbacks "Israel's tallest tower to be built in Tel Aviv"